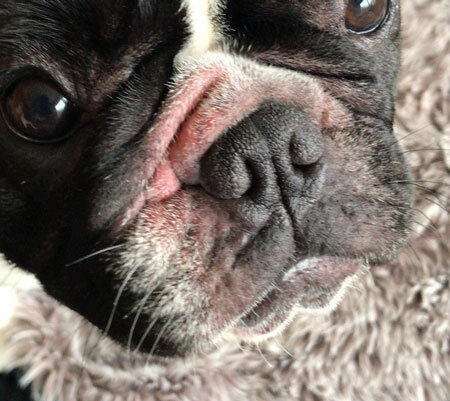 Nelly is a lively 18 month old French Bulldog. She was presented to the soft tissue surgery service for investigation of stertor and exercise intolerance due to suspected BOAS disease. She also regularly regurgitated food and froth. 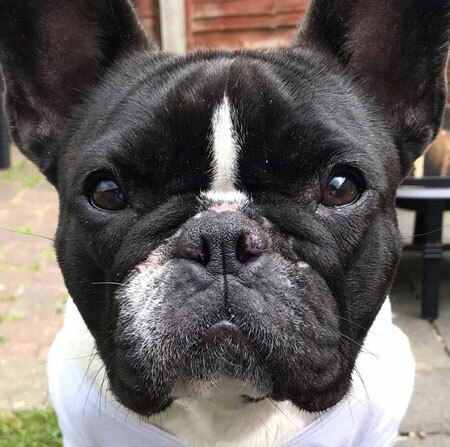 Dogs like Nelly frequently show signs of the sort of mild oesophageal disease commonly seen in brachycephalic dogs (esp English and French Bulldogs and Pugs), and which can occasionally lead to aspiration pneumonia but more commonly causes temporary partial obstruction of their already-narrowed airways. The signs were overt regurgitation of food and froth, as in Nelly’s case, but can often be more subtle, such as excessive licking (air, feet, bedding, floor) or frequent gulping and swallowing. A barium swallowing study, performed under fluoroscopic imaging, is often used by the surgeons at Highcroft Veterinary Referrals. This aids evaluation of this problem, and detects concurrent problems such as oesophageal diverticula, impaired peristalsis or hiatal hernias. The reflux is often worsened by stressful events and some medications, as well as general anaesthesia. 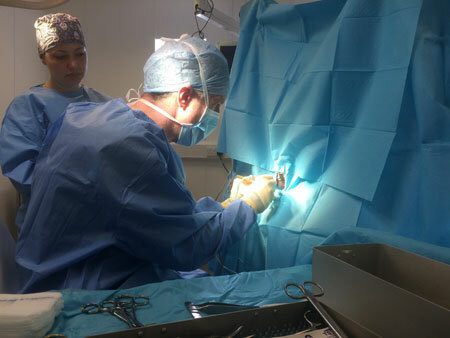 Particular considerations attend general anaesthesia of these patients and, at Highcroft Veterinary Referrals, our Specialist anaesthetists and highly trained nurses have huge experience and skill in looking after the needs of these higher risks dogs. It is also worth noting that, until the larynx is directly examined during induction of anaesthesia, the presence of secondary laryngeal collapse is unknown, and the surgeon and anaesthetist must be ready and able to deal with this possibility. Prior to general anaesthesia and surgery, Nelly was stabilised with antacids and specific feeding management changes (slow feeding of a softened, hypoallergenic diet from a step, with the pet being held in a particular position for minutes afterwards) are key to preparing dogs for safe BOAS surgery. Without this groundwork, there is an increased tendency to reflux and aspirate in addition to an inflamed pharyngeal environment in which the surgeon must operate. Nelly’s procedure went smoothly and, after surgery, on going feeding management changes and antacid medications were continued, as they are so often beneficial. They may be particularly required in advance of anticipated trigger events, such as long car journeys, kennelling, routine surgical procedures and such like. A global approach to this complex problem helps optimise treatment outcomes and minimise peri-operative risks. Whilst the actual surgical procedure must be performed accurately, it forms only one part of the necessary pathway to improving dogs such as Nelly.